Tara Star Nails: I'm an award winner! Hi everybody!!! I am so excited! 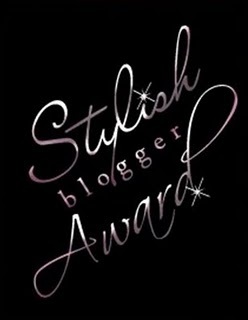 I've been given my first blog award ever! :) It's the "Stylish Blogger Award"
Ida Pie from Piece of Pie gave it to me! Thank you so much Ida Pie!!! :) :) I am still really new to the whole blogging community, so this means a lot! To formally accept my award I must follow the four rules shown below. 1. Thank and link back to the person who sent you the award. 3. Spread the love. Award recently discovered bloggers. Ok, seven things about me! 7) I beat Portal 2. Portal and Portal 2 are my favorite games. Seriously, if you have never played them, they are amazing!!! and Thank you so much!! !